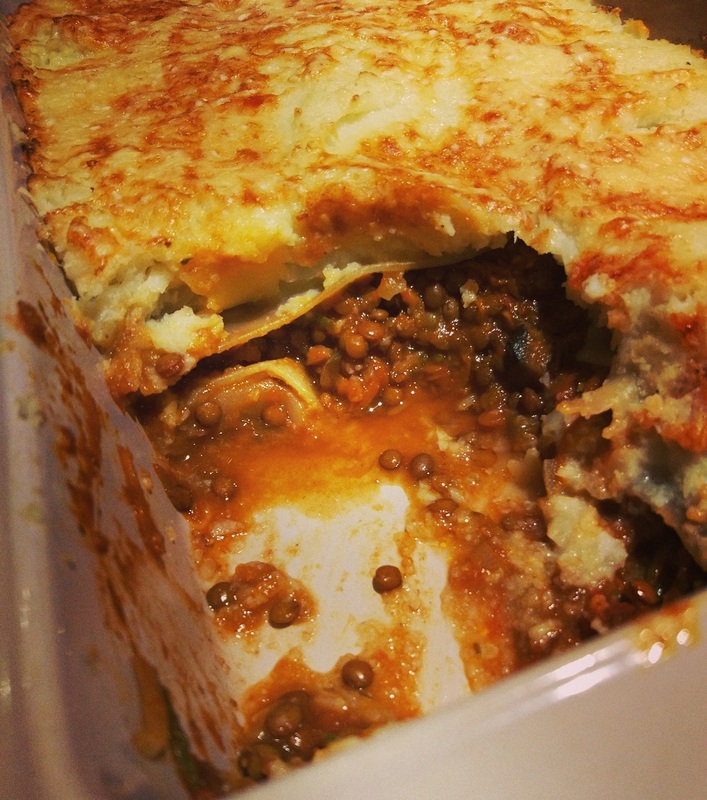 This dish – Lentil, Vegetable and Mushroom Lasagne – ticks a lot of boxes for me – it’s delicious, loaded with hidden vegetables, has my favourite puy lentils to provide protein and fibre, and gets the thumbs up from the family. You might be aware than many Australians are not eating enough vegetables and are not even getting close to the recommended 5 serves a day of vegetable and legumes. This dish, all on its own, provides your 5 serves, and if you add a salad and some other vegetable throughout the day your body will thank you! There is a little preparation required but once the lentil, vegetable and mushroom sauce is simmering away, the rest is easy. The Cauliflower Bechamel is so easy to make and again provides more vegetables. Preheat your oven to 180℃ / 350℉. Soak the lentils overnight or for a few hours if you can. Chop and grated vegetables. Heat a large pan on low heat, add olive oil and then chopped onion. Saute onion for a few minutes until translucent. Add celery, carrot and zucchini and saute for another few minutes. Now add lentils, tomatoes, water/stock and oregano. Simmer for 20 minutes. Add mushrooms and keep simmering for another 10 minutes. The lentils should be holding their shape but soft enough to eat. Season with salt and pepper. Now add the fresh spinach/silverbeet and herbs and mix through for 5 minutes. Remove from the heat. The cauliflower bechamel can be made while the lentil sauce is simmering away. Wash and cut up a head of cauliflower. Place in a saucepan with a about 10 centimetres of water. Put the lid on and cook cauliflower for about 10 mins until tender. Place cauliflower in a food processor with leftover cooking water, butter, salt and pepper. You can add a splash of milk here but be careful not to add too much. Blend until the cauliflower becomes a thick sauce like consistency. Grab a big lasagne dish (mine is about 34 x 18 cm) and rub with olive oil. Place a layer of lasagne sheets on the bottom, then add the lentil mix, add another layer of lasagne sheets, then add the bechamel. Top with parmesan cheese if desired. Place in the over for 30 mins. Serve with a salad.